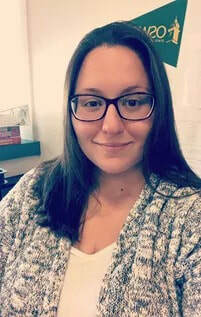 Laura Della Rocca - STEER FOR STUDENT ATHLETES INC.
Laura was born and raised in Yonkers and is currently in her 8th year of teaching at Palisade Preparatory School. Laura began her career teaching tenth grade English but has since moved on to teach AP English Language and Composition, Syracuse University Writing 105 and English 12 Composition. Prior to this school year, she coached volleyball at Palisade Prep for 6 years and for the last two school years was the assistant softball coach. She is also very involved in activities for our outgoing seniors, like their senior bbq, prom and graduation. Laura attended college at SUNY Oswego where she majored in Adolescent Education with a concentration in English. Laura earned her Master’s degree from Mercy College in Literacy birth-12th grade. Laura’s love of sports was instilled in her by her parents. At six months old, her parents pulled her out of her crib and rubbed her head praying for a Mets victory in game 6 of the 1986 World Series. Following this incident, the ball famously went through Bill Buckner’s legs and the Mets won game 6 and eventually game 7 to win the World Series. Laura and her family have been waiting 31 years for another championship from their favorite baseball team and have suffered an even longer drought from their favorite football, the New York Jets. Obviously, rooting for these teams has taught Laura patience and perseverance which subsequently make her a sound mentor.